Much more difficult to manage to recognize than the outward culture of our ancestors is their inner soul bearing. No report shines into this early period, no singing announces it, no pious song. It is probably certain that words of venerable devotion flowed from the lips of our ancestors as well, when they stood before divinity, words that shaped the unspeakable and formed into song. But nothing of it has been preserved for us. Even though Germanic man knew written signs already in the Bronze Age, he long remained without a sense for the value of written language. Even the rune stones from the 1st century A.D., despite their more than ample number, report almost only insignificant things in this regard. There as well, the southern Swedish cliff drawings appear to again gain more significance. For they are, after all, downright strewn with religious symbols, such as sun wheels, swastikas and such. But they seem to already also suggest the divinity; figures with sun wheel or sun spiral, double axe in hand, who are revered in the eastern Mediterranean as signs of the Thunder God. Apparently, the cliff etchings in their clumsy form symbolically portray a kind of religious spectacle into which the divinity as well actively intervenes, like we know similar from Greece. But perhaps they also seek to portray cult processions, at which the sun wheel was ceremoniously carried at the front, or magic acts that are supposed to heighten the fertility of the field or ensure the success of whatever enterprises, sea journeys, military campaigns. A divinity of gods is often recognizable: the Sun God with the wheel cross, sometimes also the lightning hammer, on his head goat horns, next to him his one-armed companion, both of them often towered over by the god with the great flaming hands, with spear or horse. This one with his signs is reminiscent of the later Odin (Woden), with the horse Sleipnir, the god of dawn, of the morning wind, the old hunter of saga. 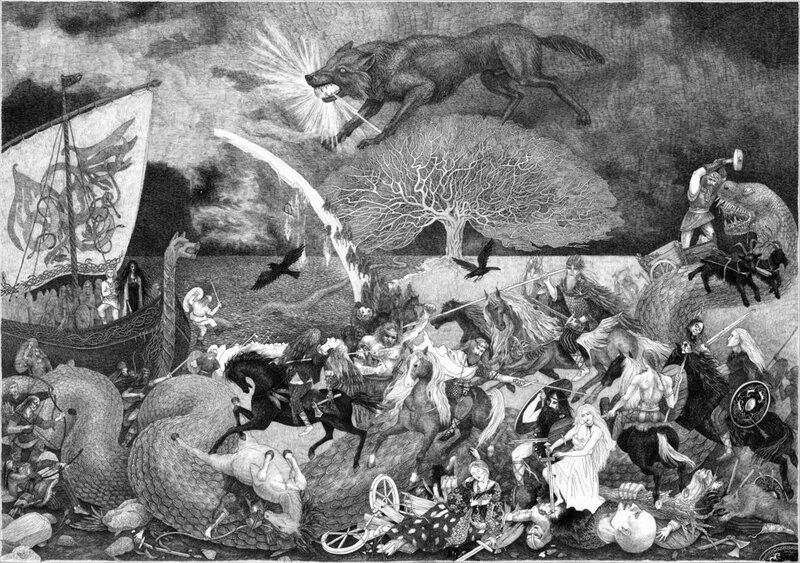 Thunder God is Dinar, whose wagon is drawn by two goats, the one-armed man probably the moon god (Tyr, Tiu, Ziu), whose right arm was bit off by the Fenriswolf — the old Germanic explanation for the eclipse of the moon. Aside from that, divinities also appear alone, so does the Thunder God consecrate two married people. Often we see the pair of twins of the Alken, who for Germanic man embody the change of seasons. Related features indeed resound in the practices of the present, nonetheless, we resist seeing in the cliff etchings with the fantastic view, their tendency to the magical, our father’s world of faith. They seem to stand in total contrast to the calm, balanced nature of Germanic man. Almost nothing seems to correspond to them in the southern Germanic region. Tacitus expressly emphasizes that Germanic man possessed no images of the gods, but “named with the name of the mysterious, which they looked at only with reverence”. One clearly senses how the Roman felt no understanding for the veneration of the invisible divine power. He held to names, he was glad that he could rewrite them at another place in his book with Roman names. But we actually find nothing of a polytheism in the Icelandic peasant stories. Each faithful person stands in a trusting relationship to only one god, whom he “asks for a good annual harvest and peace”. One gains the impression that the divinity’s name, to whom the individual turns, is totally insignificant and at most changes according to the special side of the divinity that one seeks. This one God’s forms or manifestation are indeed manifold, that means, one only personifies his workings, and now names this with names like Thor, Woden, Tyr, etc. Similarly, after all, we still today, during a storm at sea, speak of “blank Hans” [white Hans], and during a gathering at a storm of the “black man” [schwarzen Mann]. One did not thereby portray the divinity himself, rather only this one of his activities. But it is never so that the faithful had the choice to call this or that god, or, if he should for whatever reason turn away from his “friend”, he could seek another one. In such a case, he remained godless just like among us today. But since we know that Indo-Germanic man as well already probably only revered the one Sky God, we cannot rightly believe that his descendants in the Bronze Age practiced polytheism in order to later again return to a kind of monotheistic faith. For them as well, we must presume a pure and noble view of the otherwordly, such as radiates toward us from all of Germanic antiquity. But it also downright forms the prerequisite without which Christianity could have never taken a foothold among the Germanic folks. But those cliff etchings seem to shape concepts that only in part correspond to the more perfected ones of Germanic man. Perhaps we see in them a Germanized populace, which brought along its early views into Germanic man’s world of faith.